Associazione Italiana Biblioteche (AIB), Forum del libro, Associazione Bianchi Bandinelli, Generazione TQ and Presìdi del libro, with the support of IFLA - The International Federation of Library and Institutions, as well as EBLIDA - European Bureau of Library, Information and Documentation Associations, make a plea to the entire Italian community to create a turnabout in policy and draw more attention and resources to Italian libraries. We must do this before it is too late. Libraries play an essential role in our Country's cultural, social and civil life and can be seen as one of the cornerstones of democracy based on both freedom of expression and dialogue. Libraries contribute to the foundation of knowledge by collecting, organising and making available all the products of creativity and talent; by giving access to a wide range of information and ideas and by helping researchers' work. Moreover, they preserve the cultural memory of the country, give citizens opportunities for cultural growth and personal development, and support the capacity-building needed in our social and working life. In Germany, the number of people attending libraries exceed that of people going to football matches in the Premier League; in the US, investment in libraries is an essential part of the government's measures to fight the financial crisis; in France, the UK and Spain national libraries can rely on both funding and professional staff, facilities and resources. While in these Countries libraries are considered essential services that need to be preserved and supported (since they contribute to the building of community spirit based on culture and education) in Italy they are dying due to a short-sighted cultural policy and economic crisis, and therefore need everyone's support. Many libraries (public, local, university, school and institutional ones) suffered heavy cutbacks in both budget and staff, a stop to new additions and even a reduction in their opening time. All these drastic measures can undermine libraries' public functions and represent a threat to the citizens' rights to culture, education, knowledge and value sharing. A country deprived of efficient libraries turns into a country with no memory and no future. Every time a library closes down, democracy and freedom suffer a reduction of living space. A Government afraid of facing libraries and cultural issues - by transforming a public debate on their roles into a matter of public order – as happened last Tuesday, October 11th is a government of ignorance. In front of Rome's National Library, people joined together to support and stand up for libraries, but they were welcomed by riot police and locked gates; this Government has betrayed the common interest and even denies the right to debate such problems. 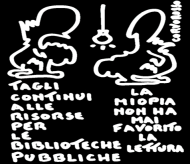 Also joined the plea: representatives of culture and publishing industry scene, of the library scene, Associations (see complete list at italian version). Copyright AIB 2011-10, last update 2011-10-28, maintained by Redazione AIB-WEB.